Pew! Someone must have shot Eve Online’s next expansion with an Asteroids laser, because it’s split into ten smaller expando-rocks set to spin out across the next year. The first, Kronos, hurtled into one of the best PC space games last month. CCP’s radars indicate its follow-up is on a similar collision course. 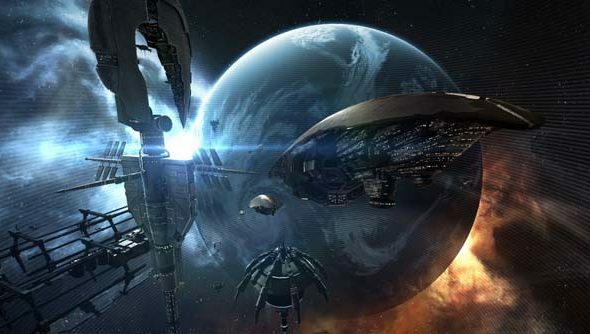 Named Crius, it’s due to make shockwaves in Eve’s industrial sector come July 22. Crius marks the biggest changes to the game’s industry and manufacturing systems in all of Eve’s 11 years. CCP have called the update their “industrial revolution” – driven by more accessible interfaces, dynamic pricing, and new organisational structuring into Teams. In the spirit of Eve, teams are player-made crews who can be hired by the highest bidder. When working together, industry specialists will generate “system-wide bonuses to manufacturing, copy and research jobs”. Efficiency! Business sense! The sort of stuff that has Corp types frothing at the mouth. Dynamic pricing, meanwhile, has been introduced to tackle the “age old problem” of ship-building when every installation is in use. Elsewhere, the developers have put together a more efficient research panel and introduced new build options for starbase owners. The ability of spacefaring captains of industry to adapt to all these new changes will be reflected in the ambient noise all around them: busy stations will soon be alive with bustle, and quieter bases conspicuously silent. “Some call it procedurally generated atmospheric auditory cues, but the smart capsuleer knows it’s just the sweet sound of opportunity knocking,” say CCP. I imagine some of you Eve opportunists have already begun plotting, yeah?